Also in 2019 Microtech Gefell / MTG presents new high-end measurement solutions from its own research and development department at international trade fairs. Traditionally a special focus is on the SENSOR+TEST. SENSOR+TEST is the world's leading forum for sensor, measurement and testing technology with an annually growing number of exhibitors and trade visitors. In 2018, 591 exhibitors from 32 nations impressively presented the entire spectrum of metrological system competence from sensors to evaluation. 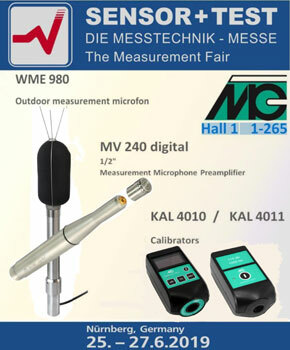 The fair is also one of the most important scientific forums in the world in combination with the 20th GMA/ITG Symposium Sensors and Measuring Systems 2019.
as well as the calibrator KAL 4010 (for 1", 1/2" or 1/4" measurement microphones, with PTB type examination and sound pressure level of 94 dB or 114 dB at 250 Hz or 1 kHz) and KAL 4011 (for 1/2" or 1/4" measurement microphones with sound pressure level of 114 dB at 1 kHz).